Air-raid precautions card for H.B.O’Neil, 154 Ainslie Street, Barrow. Dated 01.01.1940. 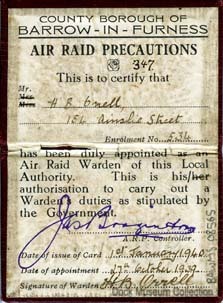 The card certifies that Mr O’Neil had been appointed as an ARP (air raid precautions) warden on the 27th October 1939 (card issued on the 1st January 1940). War was announced on the 3rd September 1939. A.R.P. wardens were expected to maintain the blackout, report bomb damage and took part in the rescue of civilians during the Second World War.